Myotonology, also known as microcurrent facial toning, addresses droopy eyelids, loose skin, sagging facial muscles, and facial wrinkles. During a session, we are able to isolate about thirty muscles in the face. Proper tone is restored to the facial muscles by stimulating muscle fibers with low electrical impulses This non-surgical process has been featured in Vogue and on Oprah and has been used by numerous celebrities for years. Models use the procedure before photo shoots for stronger definition. Sharon Friend draws on her background as a healthcare educator, and has treated a loyal clientele of celebrities since opening her myotonology practice in 1994. She combines her health care training with esthetics in order to bring her clients cutting edge facial rejuvenation services. 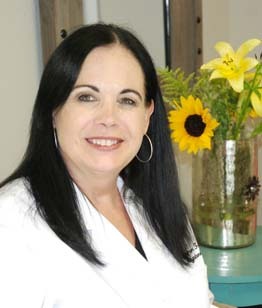 Sharon has earned national recognition for her expertise in myotonology facial toning. She is certified in Oncology and Para-Medical esthetics. Sharon adds that Myotonology® is an excellent treatment for muscles after extended Botox treatment has left the muscle atrophied and sagging. For clients, the treatment is relaxing, with no down time and no pain. The majority – 95 percent of Sharon’s clientele – men and women alike, request nothing but Myotonology® treatment.